I had the pleasure of getting together with some of my local blogger friends for an awesome dinner last night at Phoenix City Grille to talk Holiday cards and Shutterfly. What’s better than friends, food, and photos?! Dinner was SO good and they had gluten free options too! The cards we got to look at were SO cute and I hadn’t seen their gifts recently and was surprised at the cute and contemporary designs. We had a great time getting to check out some Shutterfly cards and their new Family Photos site. Love the idea on this site about setting up a family photo day with another family for a chance to get IN the photos yourself while also photographing your friends (and they photo you)! Shutterfly is running a Cardworthy photo contest on their Facebook page right now until December 9th. The Grand prize is a family trip for 4 to a location of your choice! Check out their Facebook page for all the details! In addition to all of that I have $50 to Shutterfly to give away to one of you!! I know you need cards, prints (December Daily anyone) a book, or gifts for the holidays! If you’re in an RSS feed click over to see the Rafflecopter widget below to enter! Giveaway promo code terms: Offer expires 3/14/13 (11:59 pm PST). 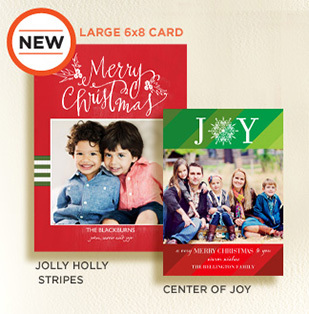 Offer is good off total order at Shutterfly.com. Order total must be greater than credit before taxes and other charges in order for discount to apply. Offer valid for one time redemption per billing address. Taxes, shipping and handling apply. Disclosure: I was given a Shutterfly credit for myself in addition to the one I’m giving away. All opinions are my own!